Tamiya has unveiled a 1/12 scale YZF-R1M plastic model at the Shizuoka Hobby Show, that was open to the public from 12-13th May, 2018. One cannot distinguish by the photos whether it is the full-scale real bike or the plastic Tamiya model, such is the high degree of perfection in its finish. Also, this year marks the 20th anniversary of the R1, so there was a first generation 1998 model exhibited too. At the 2017 Tokyo Motorcycle Show, Tamiya caused quite a stir when it exhibited a 1/6 scale model of the CRF1000L Africa Twin along with the real bike. 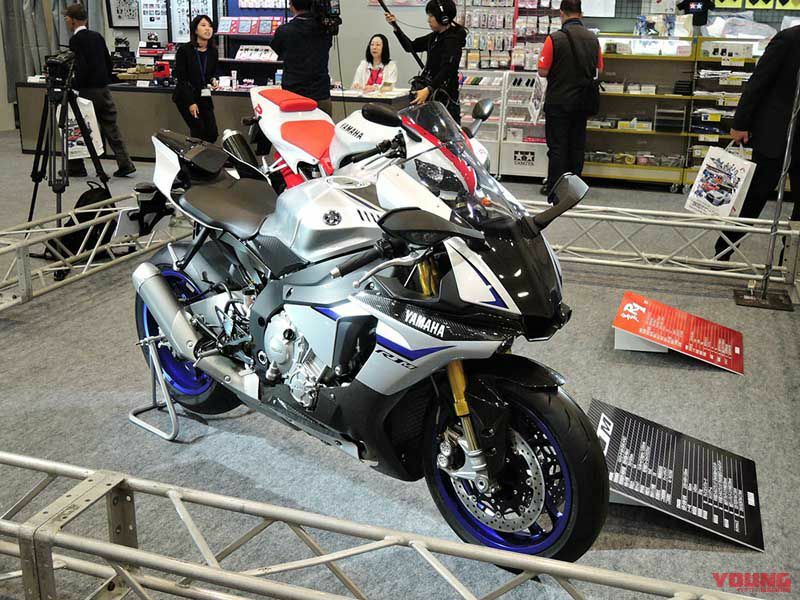 Well, in May this year at the Shizuoka Hobby Show it unveiled a model of the most recent YZF-R1M. Being 2018, this marks the 20 year anniversary of the YZF-R1 that was born in 1998, so full-size bikes of the first generation and current model were all lined up and exhibited to celebrate the occasion. 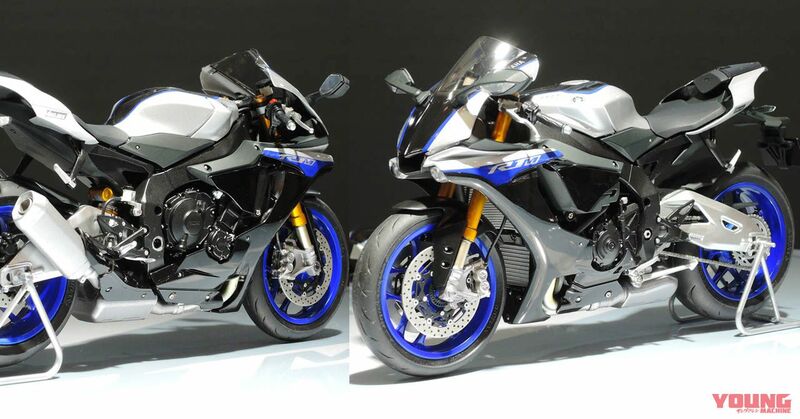 Of course, various plastic Tamiya models such as the first generation YZF-R1 model were lined-up on display, and also a 1/12 scale model doubled up with the first generation and current generation machines. Certainly this was nothing but an R1 related unveiling! Upper section (Tamiya 1/12 Yamaha YZF-R1M [provisional name]. Price: TBA. Time of release: Planned for summer 2018) Overall length: 172mm. Parts for the front cowling area like the headlights, indicators and inner cowling are all organised separately. The front and rear tyres are produced with a new elastomer material making the tread pattern look super real. You can tell by the colouring how it is the 2018 model. *Because this is a prototype model, it may be the case that there are some discrepancies with the commercial version. Lower section (Tamiya 1/12 scale Yamaha YZF-R1. Price: Approx $25. Date released: December 1998) The first generation YZF-R1 plastic model is still available to purchase. On this occasion the Tyler Racing custom spec was also lined-up on show. 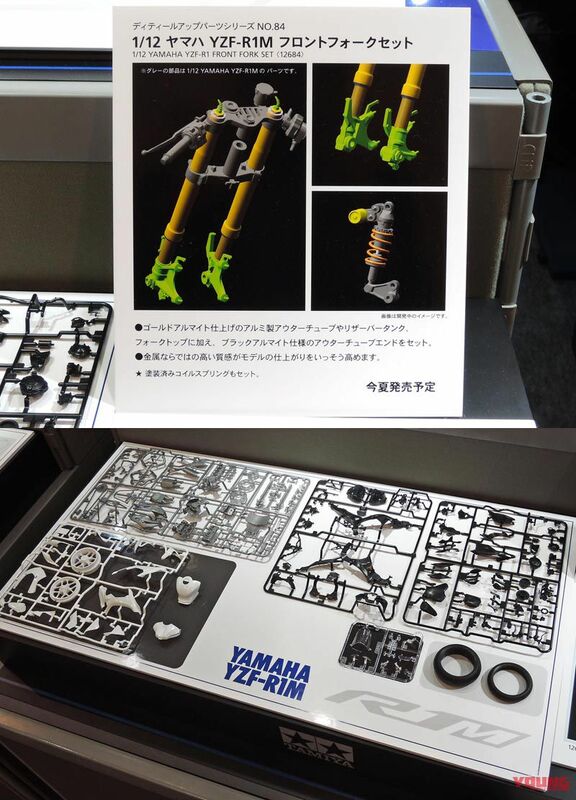 Much in the same way as other Tamiya plastic models, parts are broken down individually just like the real bike itself. Even if you remove the cowling you can appreciate features like the elaborate frame and engine. It has inherited details from the 2015 circuit based YZR-M1 model that has always set its sights on being the fastest. Such features include the frame, cross-plane crankshaft four-cylinder engine, electronic controlled Ohlins suspension, and the full colour cockpit meters, all of which are replicated to an incredible standard. Detailed photos of stripped down 1/12 scale Yamaha YZR-M1. This is also not the actual bike itself, but the plastic model. As expected it has a top finish, with such features like the painted outer-tubing on the front forks and the heat stained exhaust pipes, all in all offering an amazing sense of the real bike. Also, the spring for the rear shock is pre-painted. In addition to the aluminium made, golden anodised-finished front fork outer tubes & fork tops, it was also announced at the same time how there will be a further upgrade parts set made available with a black anodised aluminium spec. As expected the use of metal only heightens the finish yet further of the plastic model. Furthermore, there is a pre-painted rear shock spring included in the kit. The further upgrade parts were announced at the same time as the main bike parts. The metal anodised front forks replicate a real sense of quality, and are more effective than the painted versions. However, it is essential to buy these at the same time, as it is not possible to affix these after having completed the model making. The lower section photo shows the state of the main parts prior to construction. Scene of the exhibition held at the 57th Shizuoka Hobby Show. One was able to compare the real R1/M and the plastic model R1/M.